My current arsenal of centres, faceplates and chucks for holding work on the lathe have one thing in common; they all leave tell tale evidence of their use (unless you are very careful, or devious!). My usual finishing method of reverse chucking and finishing by hand, off the lathe, has suited me admirably for a number of years, so why a vacuum chuck? 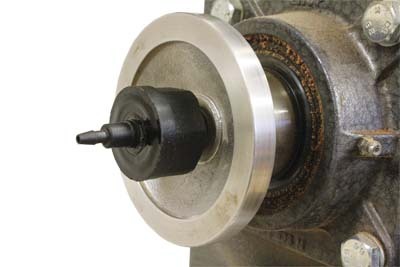 There are a number of off-the-shelf and DIY solutions to the problem of connecting a fixed pipe to the rotating spindle on the lathe. I decided against any permanent fixture because I wanted to maintain access for using a knockout bar for drive centres. Of the solutions I found, there was the Airpress rotary adaptor that simply screwed on to the spindle nose at Â£162; the Oneway rotary adaptor at Â£100 which attaches to the outboard end of the spindle and a choice of two makes of through spindle adaptors - the Holdfast at Â£35 and the E-Z adaptor at Â£50. 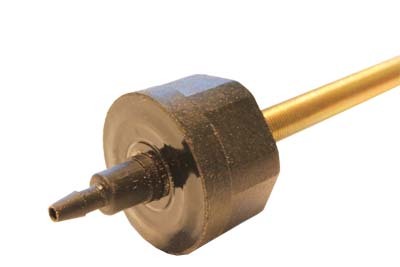 Both of these work on the same principle, namely a 10mm (3/8in) hollow threaded rod through the MT2 spindle with a bearing in the outboard end for the hose outlet. I also found some DIY plans for making my own using a length of hollow lamp rod, a bearing and some homemade bits to join them together. I decided to go for an off-the-shelf adaptor and as the threaded rod types looked like they could be removed in seconds without any tools, it seemed like the obvious choice. From the catalogue photos, it looked like the main differences between the Holdfast and E-Z adaptors was that the Holdfast was made from fibreglass reinforced plastic and the E-Z was aluminium. I selected the Holdfast adaptor as it was considerably cheaper. I wanted a vacuum chuck system to be versatile; easily removable from the lathe and inexpensive, without that leading to me having to spend too much time fabricating the whole thing from scratch. Other than this, at this stage I had no preconceived ideas about making parts myself or buying a system off the shelf. 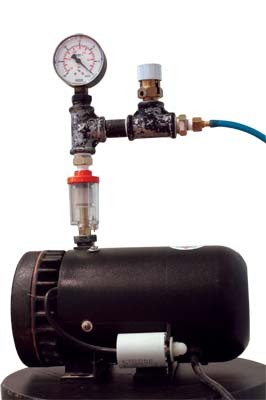 One of the main components of any vacuum system is the pump. 3. Vacuum pump. There are different types for different applications. Some are described as wet and require oil to be fed through the air intake to the pump; others are dry and require no oil in the air intake. 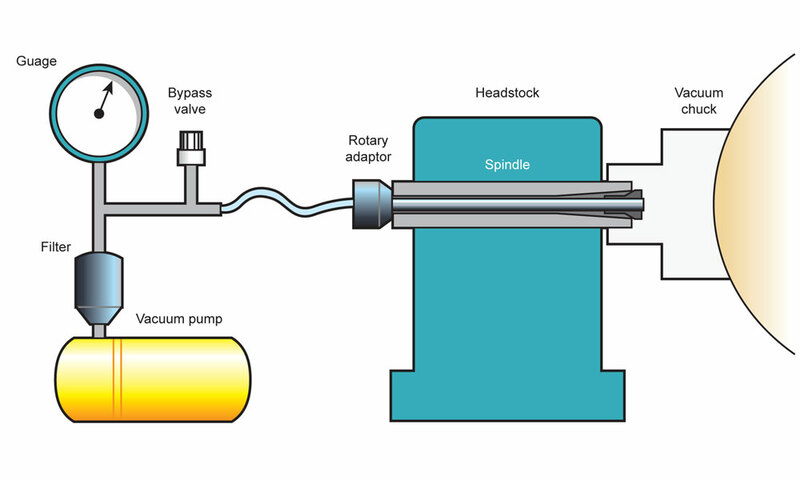 There is also a range of different types of pump but from my research, most sources seemed to recommend the dry rotary vane type. I trawled the internet for a suitable pump. Many were either too big or too expensive but I found one that seemed ideal. It could produce a vacuum of 635mm (25in) of mercury and a flow rate of 8m3 per hour, exactly what I was looking for. I got my pump for Â£150 so I was on my way. Having researched what was available off the shelf, the choices were different sizes of cup chucks, and faceplates. I also found some useful articles that explained how to make your own cup chuck or faceplate. Here I decided to opt for a mixed approach. I had spare faceplates so I thought I could use those to make my own cup chuck and faceplate, but I also decided to buy a couple of chucks to get me started. 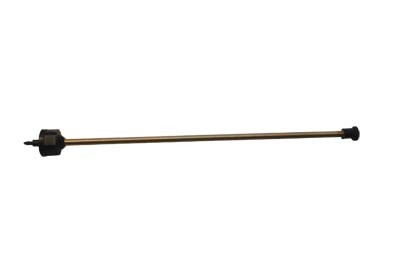 I bought 90mm (3 1/2in) and 150mm (6in) Holdfast chucks at Â£35 and Â£42 respectively. Once I could see how much I could do with the two chucks I bought, I could decide to make other ones as needed. The Holdfast chucks are moulded plastic with an aluminium spindle thread section whereas the Oneway and Airpress versions are all aluminium. Holdfast also sell packs of the neoprene seal material for Â£5.60 that can be used to make your own cup chucks, so I bought some of this too. Other materials that can be used to give a good seal between the chuck and the wood include foam mouse mats, wetsuit material and thick walled airline hose. One thing to bear in mind is that the holding force is proportional to the area of the chuck so the smaller the chuck, the less force holding the wood to it. This implies there is a minimum effective diameter for a vacuum chuck. Most manufacturers seem to start with 90mm (31â„2in) as the minimum, presumably for this reason, so I assume a cup chuck smaller than this will have a very limited grip. Once the rotary adaptor arrived, it was relatively simple to assemble and trim to the right length for my lathe spindle. I also fitted a small air filter between the pump and bypass valve to avoid dust getting in to the pump. Including the thread adaptors, this cost another Â£7. 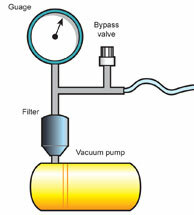 The last two key components of the system are the bleed valve and the vacuum gauge. If you are constructing your own system, a gas ball valve from your local plumber's merchant can be used. Hardware suppliers or online auctions might be a suitable source for the vacuum gauge. Fortunately, my pump came complete with both vacuum gauge and bypass valve already fitted. All I had to do was to fit the filter and replace the hose connector with a smaller diameter one for the hose supplied with the rotary adaptor. I wrapped all thread connections with PTFE tape before assembling to make sure a good seal was made. For my first real use, I had a bowl I decided I wanted to re-turn the outside of so I mounted it on the vacuum chuck. There was no centre mark so I used trial and error to get it centred with the bypass valve turned right down so I could move the bowl around. Once centred, I wound the bypass valve all the way up and turned and sanded the bowl. I was pleasantly surprised by the grip the chuck provided. I was being fairly cautious by taking light cuts but there was no sign of any movement between chuck and bowl. After I removed the bowl, I noticed some small indentations where the bowl had been in contact with the chuck. I decided to check how much force I was applying by using the maximum 25inHg vacuum with the 150mm (6in) chuck. The numbers worked out to around 350lb (160kg) of force - the weight of two people! Perhaps I had overdone it slightly?! 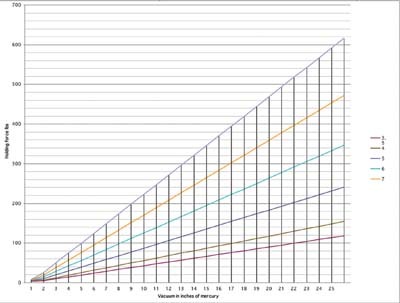 Re-working the sums showed with a 15inHg vacuum, the 150mm (6in) chuck would still generate a holding force of 207lb (94kg) which in practice seemed to be more than sufficient and avoided the marks caused by over compressing the seals. First the theory! Atmospheric pressure is taken to be 14.7 psi or 29.9inHg. This is an average at sea level but is close enough for most of us to work with. A vacuum gauge reads zero at normal atmospheric pressure and if a perfect vacuum was achieved, it would read -29.7inHg. To calculate the force (I know the SI units should be Newton's but I don't have any of those in my workshop!) holding the work to the chuck, the following formula can be used. 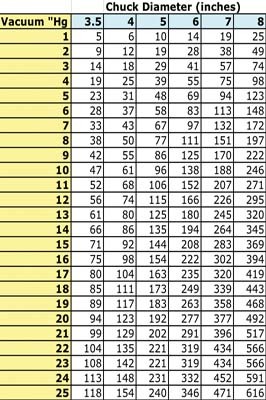 Where F is force, P is 0.49 (derived from mean atmospheric pressure being 14.7 psi or 29.9inHg), A is the effective area of the chuck and V is the vacuum in inches of mercury. Hopefully by now, we have a reasonable idea of what a vacuum chuck is capable of but there are certain limitations imposed by the nature of the material we use. Wood is a porous material and all those pores can allow air to flow through. For vacuum chucks this can be bad news because too much leakage will reduce the effective vacuum and the holding force, potentially to the point where your latest pride and joy becomes airborne! For this reason, it would be advisable to continue wearing your protective headgear and try not to stand in the line of fire, just in case. The thickness and type of wood will influence how much air leakage through the wood there will be, not to mention cracks, worm holes, bark inclusions, etc. The thickness, type and shape of the piece of wood will also influence its strength and care must be taken not to exceed what the wood can withstand or you will find your workpiece might collapse under the pressure. A textured or carved surface might inhibit a good seal. Common sense would apply here as to what can and can't be successfully held in the vacuum chuck. If your bowl or vase has changed shape since it was turned, it may no longer be round enough to make an effective seal. This is more likely to be an issue with turning green wood. When applying liquid finishes while mounting on a vacuum chuck, bear in mind that some of it may be drawn through the wood by the vacuum. This may cause differences in the appearance of the wood after finishing so it's one to watch out for. During my tests, I also found the chuck provided a good grip on an unturned bowl blank so the system could be used for initial mounting while a chucking spigot or recess was formed. Obviously this depends on there being a flat surface on the blank but I found the seals still performed well on a sawn surface as you would find on many blanks. 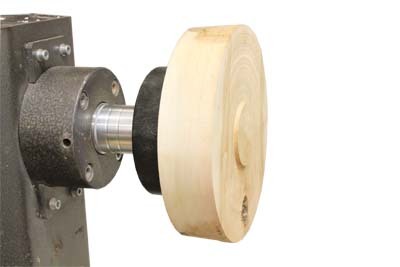 If in any doubt, it would also be possible to supplement the grip from the vacuum chuck by using a live centre in the tailstock. I think common sense would dictate how big a blank would be safe to use with this method. UK turner Paul has been turning for around 12 years and is based in Gloucestershire. His main interest is decorative turned wood. He enjoys exploring new ideas and learning new techniques. His background is in electronics and computer software.